A Dementia Friendly Community (DFC) can involve a wide range of people, organisations and geographical areas. A DFC recognises that it has a role to play in supporting the independence of people diagnosed with dementia and their caregivers. Approximately 193 communities across England are formally recognised as working towards being dementia friendly. The aim is to understand how different types of DFCs work, what is needed to sustain them and how they help different groups of people living with dementia and carers to live well. A mixed method study it includes a literature review, linking population data on dementia prevalence with DFC activities and case studies of DFCs. The latter will pilot and test an adapted evaluation tool that is currently being used to evaluate age friendly cities. People living with and affected by dementia are involved in all stages of the study. This is a collaboration between three universities who are all part of the Collaboration for Leaderships in Applied Health Research and Care (CLAHRC) East of England: University of Hertfordshire, University of East Anglia and University of Cambridge. A blog by Tony Arthur and Michael Woodward – A Q&A with the Chief Executive of Age UK Norwich about launching Norwich as a Dementia Friendly Community. Dementia friendly communities blog post 01/04/2017 – What is a dementia friendly community? 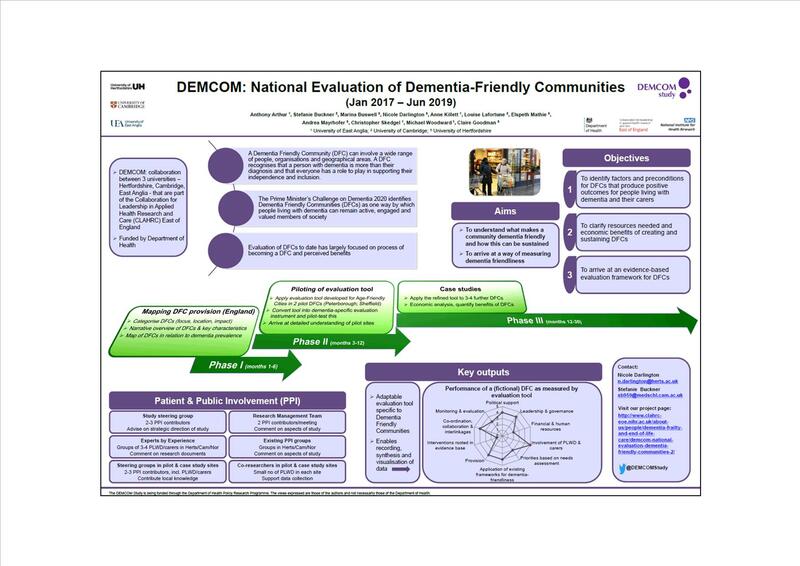 Dementia friendly communities blog post 09/05/2017 – When we say ‘dementia friendly’, what are we comparing it to? Dementia friendly communities blog post 01/07/2017 – The thing with maps…. 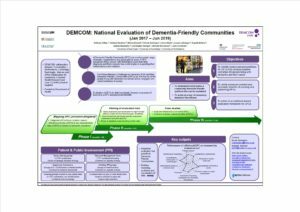 Dementia friendly communities blog post 01/08/2017 – Community Engagement Approaches for Dementia- what motivates us? Dementia friendly communities blog post 18/10/2017 – What do Dementia Friendly Communities (DFCs) offer people diagnosed with young onset dementia (YOD)? This project is independent research commissioned and funded by the Department of Health Policy Research Programme (Dementia Friendly Communities: The DEMCOM evaluation, PR-R15-0116-21003). The views and opinions expressed are those of the author(s) and not necessarily those of the Department of Health.